This was our first time on the "re-routed" trail. A significant portion of the trail is through a large boulder field in order to avoid the erosion that was in the avalanche shoot. While we were good hikers and did not stray from the "official" route. We did see hikers avoid the boulder field and go up the part of the old way ( basically from the point marked "screelow" on the topo. If there is a danger of thunderstorms while you would be out on this hike, you probably should wait till another day. You can't run down the boulder field. As David was with us, I asked, and he accepted, to carry my tripod up, which I would not need till the summit. The trail starts out at the top of Mesa Cortina, on the Buffalo Cabin trail. The trail starts off with a gentle climb through Lodgepole (mostly dead due to the Pine Bark Beetle). At .33 miles you cross into the Eagle's Nest Wildernest. At .55 miles you reach a 4 way junction. 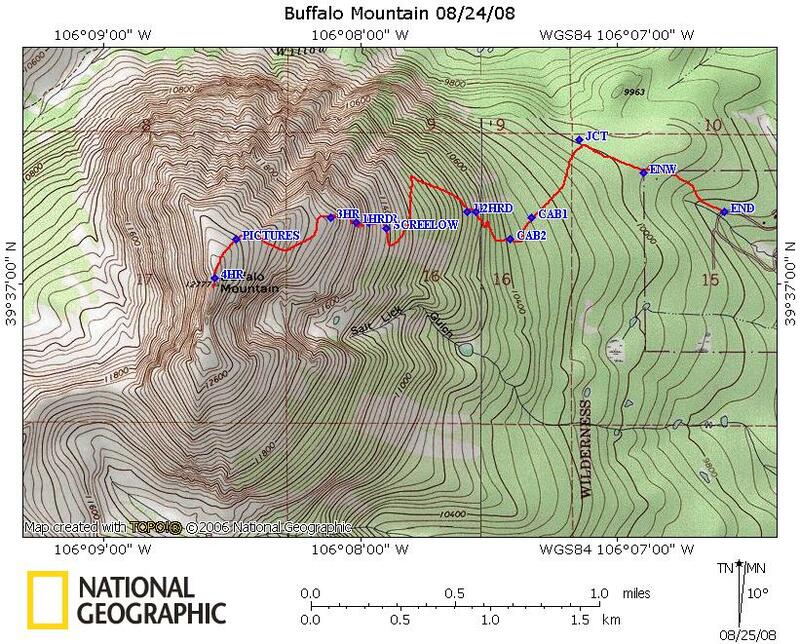 If you turn right and head downhill you reach the Royal Buffalo trailhead, going straight (actually jog left then right) and you will cross the flanks of Buffalo and end up on the Gore Range Trail. We want to turn left and head up the mountain. The trail starts to get a bit steeper and at 0.86 and 0.91 miles you reach the two cabins. After the 2nd cabin, the new trail leaves the old trail, heading WNW and continuing to climb. The Forest Service cleverly routed the trail to hit a boulder field low down on the flanks of the mountain. This boulder field was no problem. The trail continues to climb and you will occasionally start to see views of surrounding mountains and Lake Dillon. At 1.45 miles you hit a major switchback and head South. At 1.66 miles you cross into the avalanche shoot and quickly turn around again and reach the large boulder field at 1.79 miles. I did not get any pictures of the field as I had my camera stowed away in the backpack. If I were smart, I would have stowed away the hiking poles as well for this portion. From 1.79 miles to about 2.18 miles you are in this field continuing to work your way upwards. With no trees, the views become great looking at Ptarmigan and Lake Dillon. After finally rounding a "little knob" (play with the kml file and Google Earth), you come to the top of the smaller shoot that is sometimes skied in the spring. Looking from CO 9, this is the left shoot. You rejoin high alpine vegetation (above tree line) and work your way from the top of the left shoot to the top of the wider right hand shoot (left side as it is a "Y" ), then continue up a scree field and just before the summit, hike a ridge with a gentle slope that will take you to the summit. Great views towards the West are finally shown to you. The mountain drops off quite steeply on the West side (although the East side is also fairly steep). We ate our lunch on the summit. The weather started to turn and we headed back down. I took the tripod from David and stopped once for pictures of Ruby Ranch (since I have been spending more time in the front of my yard cutting trees, my house is more visible from Ptarmigan than from Buffalo, but that will change as I take down more trees on the West side of our property). A small thunderstorm developed over the mountain and did not really move. We were fortunate in that there was no lightening nearby and the hail and rain that we were pelted with in the boulder field was very light. I would not have liked to have been caught in a stronger storm. Pictures from the hike (no flowers though) here.